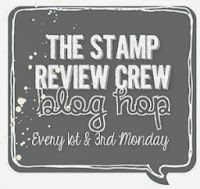 Back again with Wednesday's Color Round Up and the Petite Petals card from The Stamp Review Crew Hop. FINALLY Right?? lol I thought I would keep this post short for ya. * Ink the Gorgeous Grunge Stamp Set in Delightful Dijon, stamp onto the right side of the Whisper White panel. The Gorgeous Grunge Stamp Set is perfect for creating a collage look. * Add a piece of the 1" Watermelon Wonder Dotted Lace Trim. I scrunched it up. Add a piece of 1 1/4 White Jute Ribbon and some of the Silver Metallic Thread (this stuff is awesome). * I cut a strip of 2015-2017 In Color Designer Series Paper and attached it across the 1" Watermelon Wonder Dotted Lace Trim with Stampin' Dimensionals. * Ink the stamp from Tin of Cards Stamp Set in Memento Pad Tuxedo Black and stamp onto a piece of Whisper White card stock. Die cut it out using the Big Shot and the Tags & Labels Framelits. * Ink the stamp from Petite Petals Stamp Set in Watermelon Wonder and stamp onto Whisper White card stock. Punch out the cute flowers using the Petite Petals Punch. I just group all the different things together and pretty soon you have a nice little collage going on.